·Working with Professionals: building a team, negotiating for your child, and keeping everyone’s focus on high expectations for academic, social, and emotional success. ·Special Education: from early intervention through transition, college, and other postsecondary options, including how special education works and steps to take when it does not. · Health and Safety: sexuality education, health care, and insurance coverage, as well as understanding the real-life health and safety risks children with AS face and learning the steps that only parents can take to protect them. ·Options and Interventions: with an emphasis on established guidelines for evidence-based treatments, including medication, applied behavior analysis, cognitive-behavior therapy, Social Stories, Comic Strip Conversations, and much more. ·Planning for the Future: Teaching today for independence tomorrow. Patricia Romanowski Bashe, MSEd., BCBA, is, first, the mother of a son with Asperger syndrome, and then a certified special education teacher, early intervention provider, and Board Certified Behavior Analyst. Currently senior education specialist at the Cody Center for Autism and Developmental Disabilities at Stony Brook Children’s Hospital, at Stony Brook University, she is also author of The Parents’ Guide to Teaching Kids with Asperger Syndrome and Similar ASDs Real-Life Skills for Independence. Visit her website at www.aspergerguide.com. "Bashe's must-read third edition truly earns the title of a 'definitive guide,' with the added bonuses of being beautifully written, engaging, warm, encouraging, hopeful, and enormously practical." 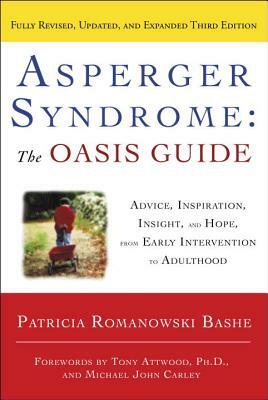 "The OASIS Guide has always been a go-to-resource for information regarding Asperger syndrome...With all the controversy regarding the conception of the autism spectrum disorders, Asperger Syndrome: The OASIS Guide is an even-handed treatment that emphasizes solid, empirical research. It belongs on every clinician's and researcher's bookshelf."